The group of grant applicants this year was impressive and the deliberation was tough, but we are very pleased to announce proceeds from the 25th annual tour will support improvements to three public gardens, a playground renovation, habitat restoration and a live community theater program. With the sale of garden tour tickets and sponsorship revenue, the committee intends to raise and distribute over $25,000 to these six amazing local non-profits: ArtsWest, City Fruit, Community Orchard of West Seattle, Gatewood Elementary School, The Fauntleroy Watershed Council, and West Seattle Bee Garden. Read more about their community-centric projects. 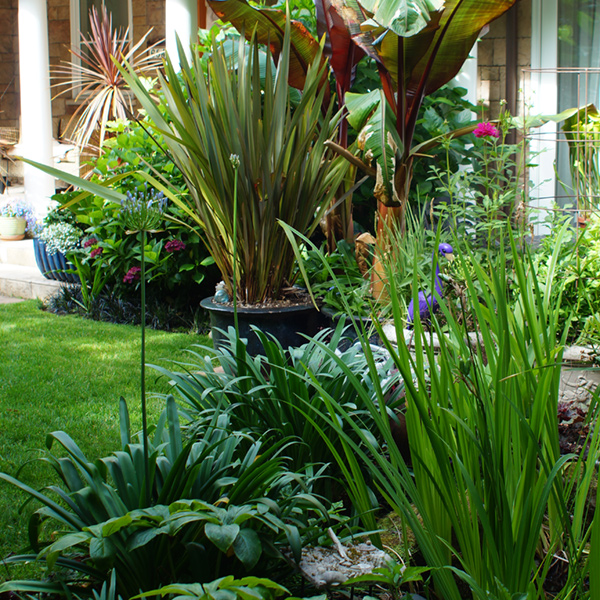 The West Seattle Garden Tour will be Sunday, June 23rd, from 9am to 5pm. Order your ticket book and come join us to tour the nine incredible gardens we've selected for you. BUY TICKETS HERE. We are excited to announce this year's winning piece of artwork from our annual art competition. It's called Garden Girl in Red Shades and it's the creation of West Seattle artist, Sheila Lengle. The 30" wide x 20" high piece was painted in exuberantly-colored acrylics. The original piece will be auctioned on the day of the tour in one of the gardens, with proceeds benefiting our designated non-profits for this year. Read more about Sheila on our site. Garden Girl in Red Shades, by Sheila Lengle, will be displayed at Caper's Home Store during the West Seattle Art Walk. A silent art auction will accompany the painting, with proceeds benefitting the 2019 beneficiaries. There will also be works by these six additional West Seattle Garden Tour Art Competition finalists: Louise Hones, Linda McClamrock, N. Naoj, Anne Strandoo, and Suzanne Uschold.